This dish is actually not intended, not this version at least. I’d wanted to cook ผัดกระเพรา Phad Kra-Prao Thai Holy Basil and Pork Stir Fry actually but I’d gotten the wrong basil! 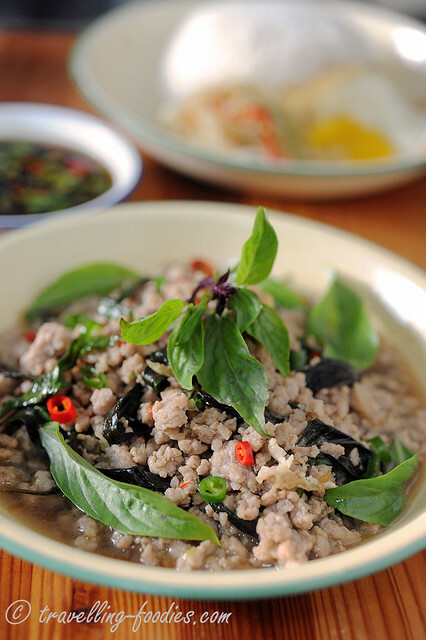 The real McCoy calls for holy basil, which is known as Bai Kra-Prao in Thai, and hence the name of the dish Phad Kra-Prao, with “Phad” to mean “stir fry” in Thai. And to add to the confusion, the latter is sometimes anglicised as “Pad” or even “Pat” or “Phat“. But I’d used Thai purple basil (sweet basil) instead! It is known as ใบโหระพา Bai Horapha in Thai and thus the “bastardised” version “Phad Horapha“. A quick search over the internet and I found that not the only one who’d made this “mistake”. Not sure if the creations by the others are accidental or intentional but whichever the case, it actually tastes really good with thai sweet basil as well! So it seems like ผัดโหระพา Phad Horapha is here to stay afterall! I bought quite a bit of bamboo shoots, tau kwa and shrimp the other day for making the filling for Kueh Pie Tee and thus the perfect opportunity to make one of my favorite soups, Pong Tauhu. Peranakan cuisine is known for its rich flavours, be it spicy, sourish, savory or sweet but once a while, we come across a gem like Pong Tauhu whose flavours and presentation perpetuate simplicity and bliss. Unlike the Loak Mejah Panjang dishes, i.e. 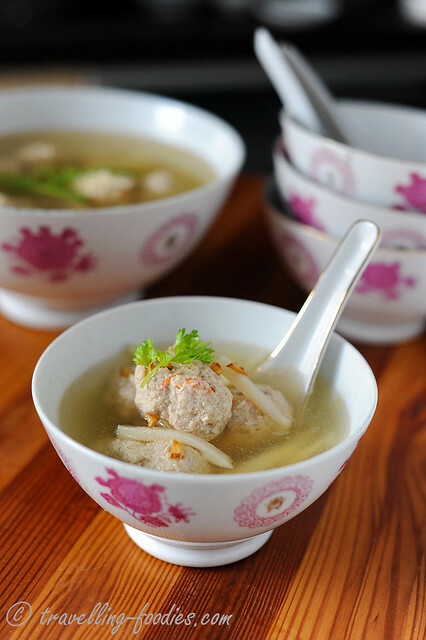 food cooked for a Tok Panjang like Hee Pio Soup, Pong Tauhu uses far less ingredients and requires less time to prepare. 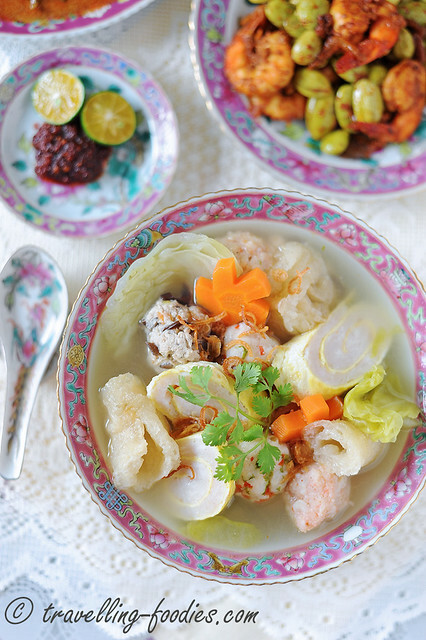 This lovely soup which bears the essence of Peranakan daily home cooking is nonetheless flavorful and gratifying. Comfort food is often what one truely yearns for when one gets home after a long day, It could be after laborious ploughing through streams of data and figures, in an almost hypnotic trance-like fashion in front of the computer hours at ends, and dinners made frugal. Or it can be after endless evenings of socialising, over martinis and cocktails amidst cosmetic conversations and superficial banter, and real food made little. When one finally gets home, and all that pomp and makeup shed off like a second skin, one can finally be oneself. That is when the cravings set in. It can be as simple as a classic Croque Monsieur with freshly toasted bread over old cheese and good ham, or a bowl of cereal with creamy full fat milk and crunchy homemade granola. Satisfying the insatiable, as one becomes overwhelmed by routine and the mundane, comfort food despite its simplicity, transcends and becomes a luxury. 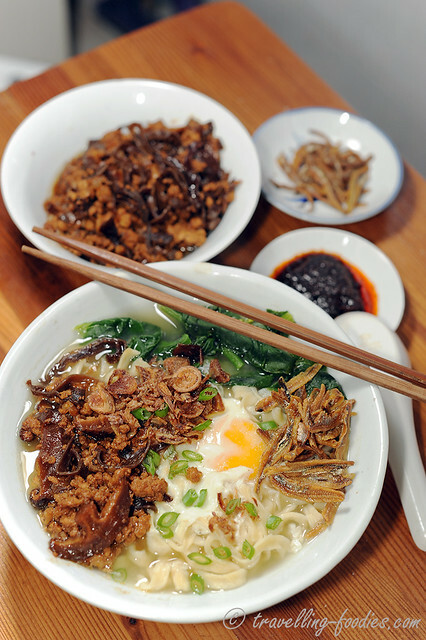 For me, nothing can be more comforting than a bowl of freshly cooked noodles. 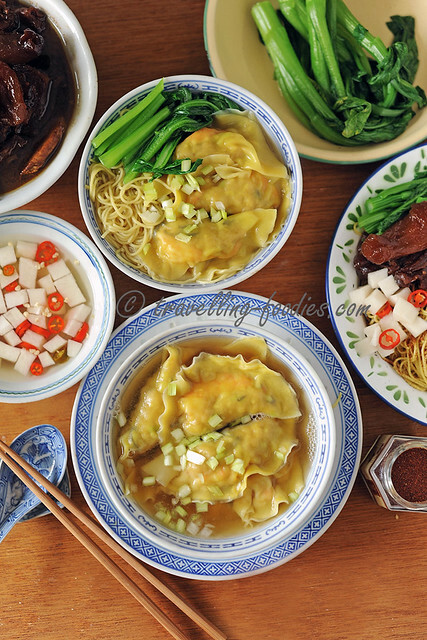 Those who know my blog well would know that I feature noodle recipes to a great extent and often to great detail as well. 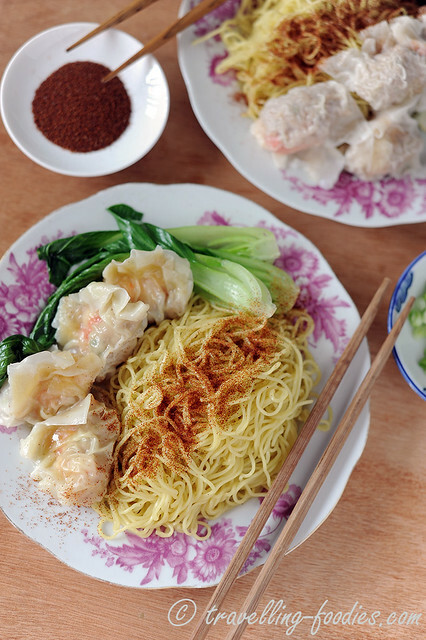 From 炸酱面 to Mentaiko Pasta, from Spaghetti alla Bolognese quite long ago to Spaghetti alla Laksa Pesto most recently… in short, I’m a sucker for noodles in all forms, and quite literally so. For me, the sheer act of slurping strands of noodles, be it ramen, pasta, beehoon or kway teow is profoundly therapeutic. Slurping unleashes an avalanche of flavours into the mouth, setting forth a plenitude of palate profiles and aromas that stimulate one’s senses all at once. Slurping is considered part of good table etiquette in the Asian context, and most rightfully so. Surely it is one of the most resounding ways, and the least one can do as a display of appreciation for a good noodle experience. Roti Babi is a Penang Peranakan dish which I have been quite curious about since I read the recipe in Debbie Teoh’s book. 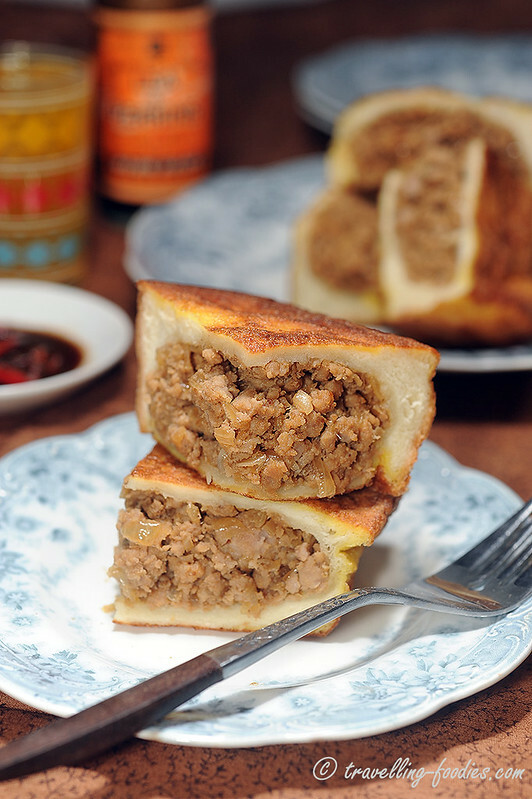 Bread slices coated generously with an egg batter reminds me much of traditional French toast, a childhood delight for my sister and I, only that in Roti Babi the bread is much thicker and stuffed with an “inti” (filling) made up of minced pork and onions. What is more intriguing is the “rempah” (spice paste) used in the filling, which consist of ketumbar (coriander seeds), buah pala (nutmeg) and cekur (lesser galangal aka “sand ginger”). I can already imagine how wonderfully perfumed the inti will be just from reading the recipe and yet at the same time, wonder how cekur actually tastes like as I’d not used it in cooking before!